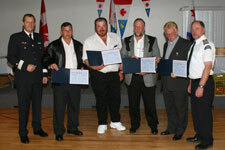 The Canadian Coast Guard Auxiliary awarded Operational Merit Medals to four of its members who rescued four survivors from the waters off Canso, Nova Scotia, on July 13, 2006, following the crash of a Canadian Forces Cormorant helicopter during a training exercise. Addison A. Underwood, Kenneth J. Snow, Captain William F. Bond and Captain J. Frederick Munroe were also presented with Commendations from the Commissioner of the Canadian Coast Guard. The crash claimed the lives of three Canadian Forces airmen.